There are three services held at Christ Church each Sunday, each with its own distinct character. Visitors are very welcome to join us at any of these. Please do stay with us after the service for refreshments and a chat, or if you would value prayer with the prayer ministry team who are always available after the service. There are also regular prayer times held in church. The 9 am service is a structured but friendly service based on Common Worship. It includes traditional hymns, more modern songs and a sermon. There is a small robed choir. Holy Communion is celebrated at least three times each month, the other being Morning Prayer. Refreshments are served after the service when people who attend the 9 am service can also meet people arriving for the 10.45 am service. The leadership team are Frank Robinson, Becky Russell, Richard Pratt and Colin Slater. 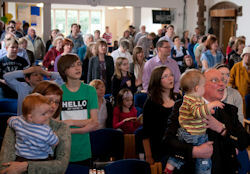 The 10.45 am service has particular emphasis towards families with children and young people. We start with coffee at 10.30 am and then join together in worship at 10.45 am. This service has communion on the second Sunday of each month. Everyone who is baptised is welcome to receive bread and wine. Groups for young people aged 0-13 run most weeks during the year. Fifth Sunday’s in a month are our all age services, as well as at Christmas and Easter. Every every fortnight the service is interpreted into sign language for Deaf people. This is an essential part of the church’s worship, enabling access to worship for Deaf people and enriching the life of the church. The leadership team are Ken Lyon, Ryan Mellor and Penny Wallace. The 7 pm service is designed to be contemporary, informal and challenging. Whilst the service is attended by our students and young people, it appeals to a wide range of ages. 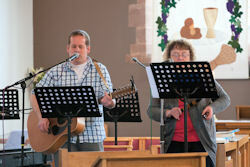 The second Sunday of each month is a Parish Celebration with extended sung worship led by a larger band. There are sometimes visiting speakers. Communion is celebrated on the fourth Sunday of each month. The leadership team are Clint Redwood, Judith Renton, George Russell and Dan Wood. The 10.45 services are interpreted into sign language fortnightly. The interpreters work with the service leaders to make the services as accessible as possible for deaf people. We often use percussion instruments that give a sense of vibration as an alternative means of worship through rhythm. 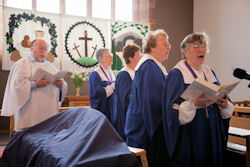 Other church events – for example, Christmas and Easter services, the church weekend away, the annual Memorial service – can also be interpreted. For more information contact Trina Beaumont, Margaret Metcalfe or Peter Benson via the church office. If you would like to be involved in the services in any of these ways please speak to one of the leaders of the services.